Home Article Bug in Google Bugs Lessons Learned Quality Software Testing Terminologies Thinking Tester Tutorial Blogger NEW + Firefox 2 = ‘Exceptional’ Error! 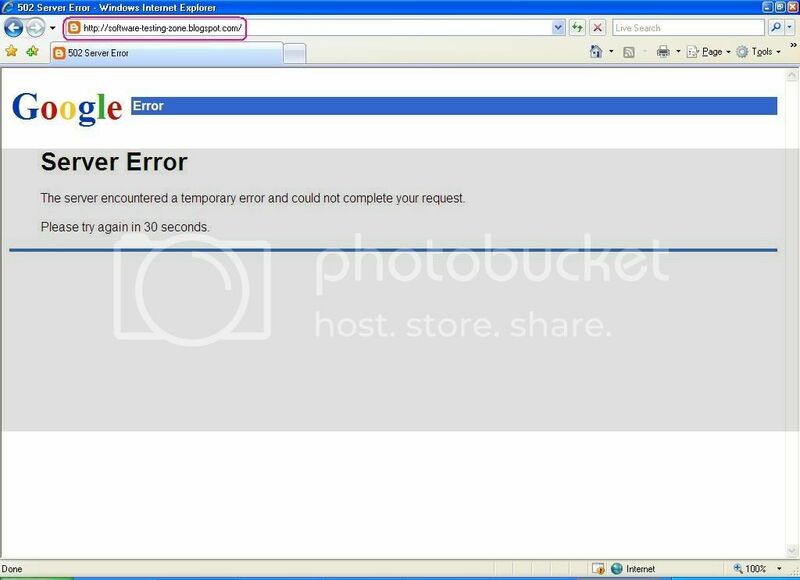 Blogger NEW + Firefox 2 = ‘Exceptional’ Error! 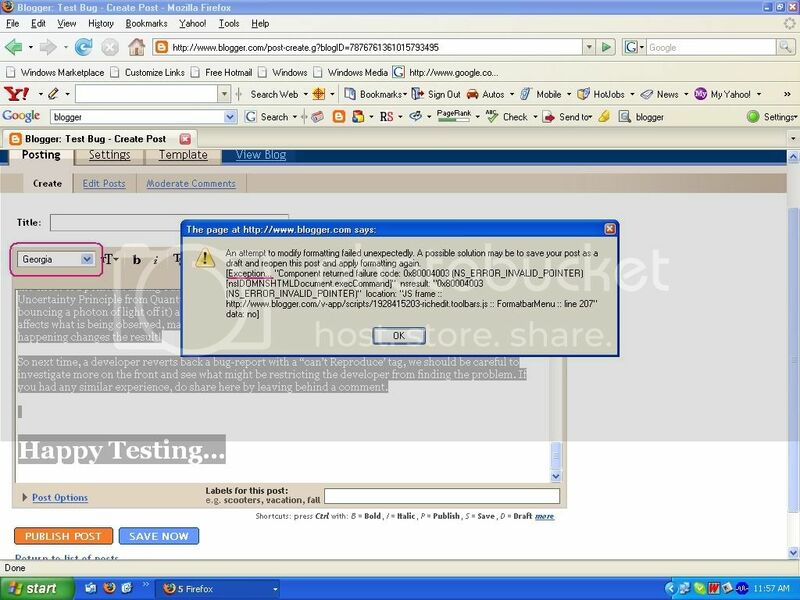 While testing, I found out a crash resulting due to an exception when creating a new post in Blogger using Firefox 2 as my browser. 1. Log in to your Blogger NEW account using Firefox 2 as the browser. 2. Click on the New Post link on the dashboard. 5. Click on the drop-down menu for fonts and select a different font. I had selected ‘Georgia’. But it appears to me as if the crash is reproducible for the other available font types too! Selecting a different font should give you the crash. If you are unable to get a crash by changing the font type, change it to another font. Soon you should get the crash! The crash report says: “An attempt to modify formatting failed unexpectedly. A possible solution may be to save your post as a draft and reopen this post and apply formatting again. [Exception…]”. I saved the post as a draft and tried to apply formatting again after reopening the post (as suggested in the crash report); but in vein! Every time I tried, I kept getting the same crash. So finally I had to give up and use Internet Explorer to get the desired formatting before posting the blog entry. 1. Copying from MS Word and pasting the text into Blogger formatting window looks like an important step to reproduce the crash. 2. Selecting all the text by using (Ctrl+A) also seems to play a major role in reproducing the crash. 3. This crash does not happen in Internet Explorer. So it looks like a compatibility issue of Blogger with Firefox 2. 4. The crash report fails to help the user at several points. a) At first look, the crash reports does look like a bunch of garbage (mostly contains technical looking information) and can be scary for a novice non-techno-savvy user! b) Although the crash message contains some log information (stack dump! ), how it could help the end user in avoiding the crash is still debatable. c) Though the report tells the user on how to recover from the crash, however, the information does not facilitate recovery! So error report fails on the functionality aspect. 5. This crash is also reproducible while editing an existing Blogger post! This crash is still reproducible (as on the time of posting of this entry). So, go ahead and try if you can reproduce it or not! Let me know your test result via commenting. How to Break MS Word 2000? Testing Google - Boundary Value Exploration! Bug in Yahoo Mail Beta! Could this be a Bug with IE7 and Mozilla Firefox2? How you report error if error occurred in two or more browsers and How you prepare test cases for that? When user try on ms calculator 2704/52 then there is bug! ans is not correct. Amazing! Please give your views on it. I think i got answer to this question. 2704/52=52. This is ok. Is it right? please give your comments.